Do you want to make a positive difference in people’s lives by being part of an international short-term volunteer project? Are you thinking about giving back to the society through meaningful travel? Are you looking for a top rated, inexpensive and safe volunteering opportunity in a foreign country to spread the common good? If so, you should check out this. 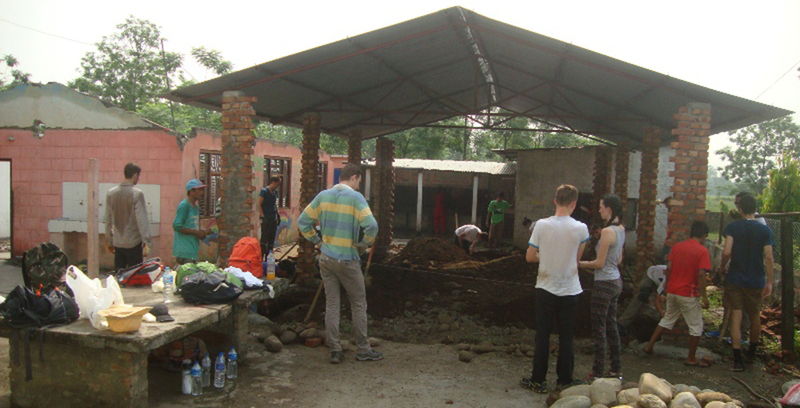 NVCYE offers the work camps/projects in Nepal by bringing 6–20 volunteers from different countries and backgrounds. You will live and work together for the betterment of the deprived Nepalese communities. The participant volunteers will get once-in-a-lifetime opportunity to live the passion of helping others, while working and living with young people from across the world. During your volunteering work in Nepal, you will make many new friends, live with a local host family and immerse yourself in unique Nepalese culture and language. You will also gain vital life skills like effective communication, learn social and organizational skills and enhance the ability to work in a team and lead from the front. At the same time, you might also take up excellent hobbies like hiking, travelling, and photography. You get to develop passion for humanitarian works and working in nature conservation by participating in this Nepal volunteer program. All in all, you are guaranteed to have a memorable time helping others in need while exploring new culture, place, natural wonders and tourist attractions. This is the most meaningful as well as safe way for you to contribute in your own little way to make this world a better place. The young individuals or group from all walks of life can join in our work camps/activities for the period of two weeks. We allow and encourage the students of university and high school to travel in a group. The minimum participant numbers for a group is 5 and the maximum number is 20. After joining the volunteer in Nepal program, you will mostly work about 6 hours a day. The work camp program starts the 1st and 3rd Sunday of each month. It takes up to 4 weeks to arrange your placement. Therefore, we suggest you to apply 2 months prior to your scheduled trip. Please notify us in advance if you require quicker placement. Note; For the Dates, you can communicate with NVCYE personnel first. No specific skills, qualifications and experiences are required to join this volunteer opportunity in Nepal. All you need to have is a strong willingness to work for the welfare of the deprived communities. You should also be open minded, excited to learn New Culture, adaptive to new circumstances, easily adjustable and English Speaking. You should respect Nepalese cultures, traditions and should follow appropriate dress-code when at the assignments. Please be reminded that kissing and hugging in public places in Nepal are considered as vulgar. Note: Apart from the above mentioned projects, NVCYE team can organize the Sport Activity and Women Empowerment Camp As well. Please contact us via telephone or email for detail information.